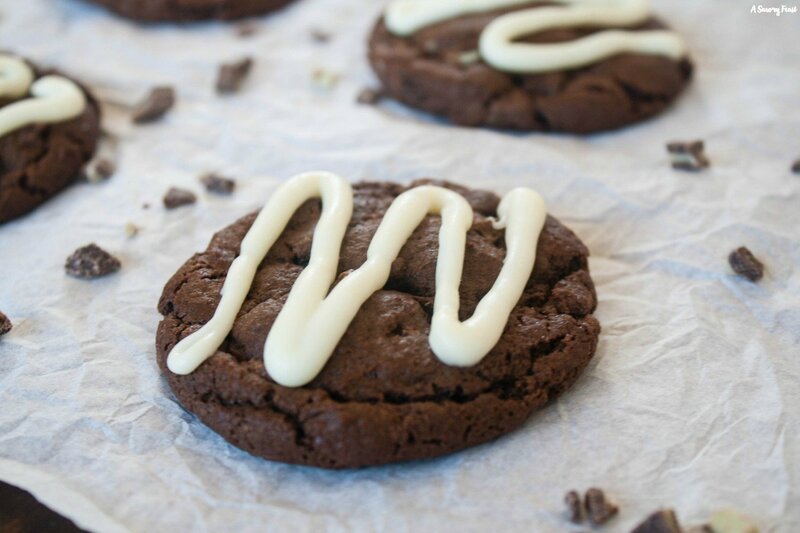 Chocolate and mint are the perfect pair in this cookie recipe! 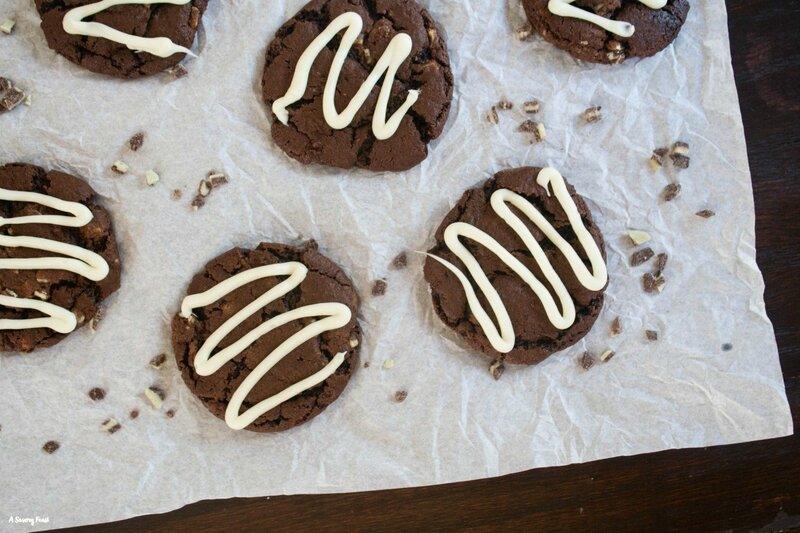 Try these Andes Mint Chocolate Cookies this holiday season. 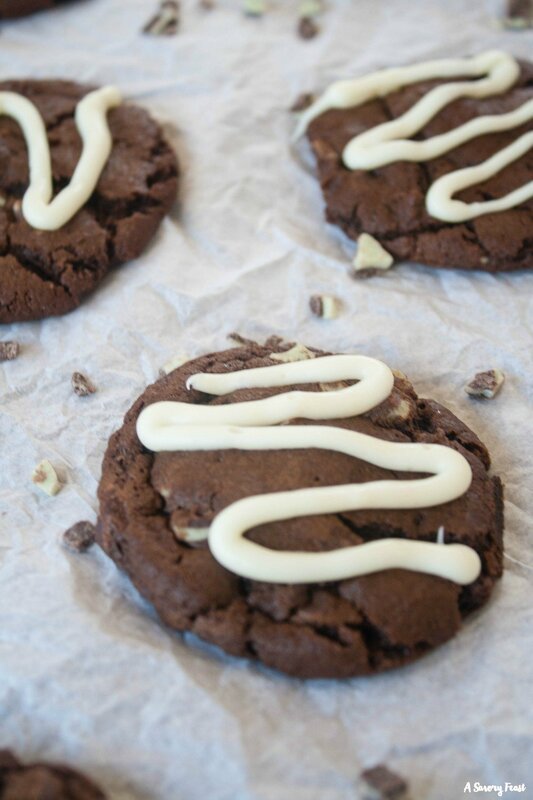 A soft chocolate cookie with pieces of Andes candy inside, topped with a peppermint and white chocolate drizzle. The holiday season is my favorite time of year for many reasons, but baking is close to the top of the list! This year I’ve created a new recipe that is already a favorite at my house. I’ve made several batches already! 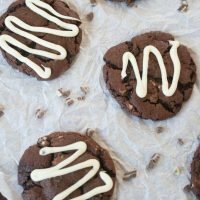 I’m sure these Andes Mint Chocolate Cookies will be a favorite of yours this holiday season, too. Every year I join in with a group of blogging friends to share cookie recipes during The Sweetest Season Cookie Exchange. If you are looking for some new recipes to try this year, you’ve come to the right place! Be sure to check out all the cookie recipes here. We will be adding to this list throughout the week. This year we are also getting into the spirit of giving and raising money to benefit Cookie for Kids Cancer. Be sure to check out the foundation and see how you can get involved! Alright, let’s talk more about these cookies now! Peppermint and chocolate is one of my favorite combinations for holiday desserts. It works perfectly in this cookie! This recipe start with a soft, rich chocolate cookie. It’s studded with Andes baking pieces (find them in the baking aisle!) and topped with a fancy peppermint and white chocolate drizzle. These beautiful cookies are sure to impress, whether you make them for a cookie exchange, holiday party, or to give as gifts. You don’t have to be an artist to create a pretty drizzle, either. I scooped my melted chocolate into a piping bag and used that to create a neat drizzle. But if you want to save time, drizzle using a spoon or a whisk. I’ve found that this recipe is so easy to double or triple, so it’s great for bringing to a Christmas cookie exchange. 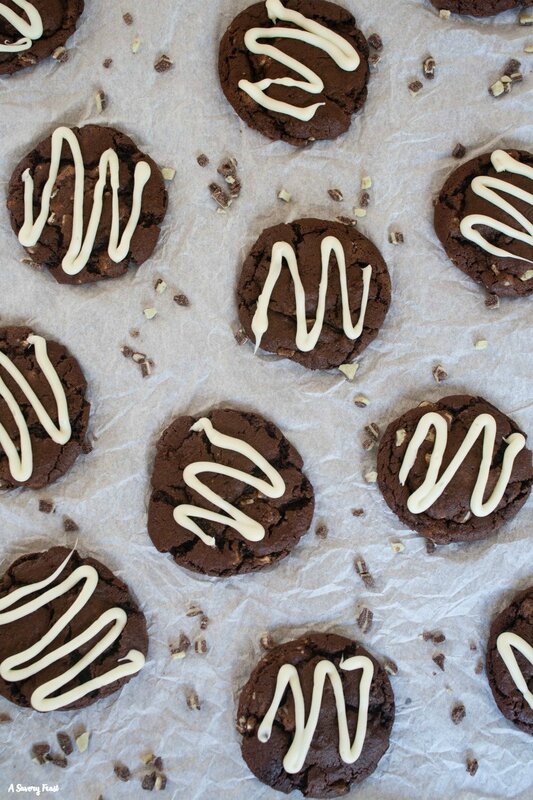 I’m kicking off my holiday baking with these Andes Mint Chocolate Cookies from @aSavoryFeast! I’ve lost count of how many times I’ve made this recipe! My friends and family request it all the time. Be sure to pin the image below to save for later! In the bowl of a stand mixer, beat the butter. Add in the brown sugar and white sugar and beat until combined. Mix in the vanilla and egg until combined. Add the dry ingredients into the wet a little at a time, stirring until completely mixed together. Use a rubber spatula to mix in the Andes baking pieces. Roll the dough into 1-inch ball and refrigerate in a covered container for an hour. Preheat the oven to 350 F. Place the dough balls a couple inches apart on ungreased cookie sheets. Bake for 10 minutes. Don't over bake or they will get too hard and crunchy. Let cool on the pan for a couple minutes before transferring to a wire rack to cool completely. Once the cookies are cool, place the white chocolate chips in a double boiler to melt. As they begin to melt, stir in the peppermint extract and heavy cream. Continue to stir until the chips are melted and creamy. 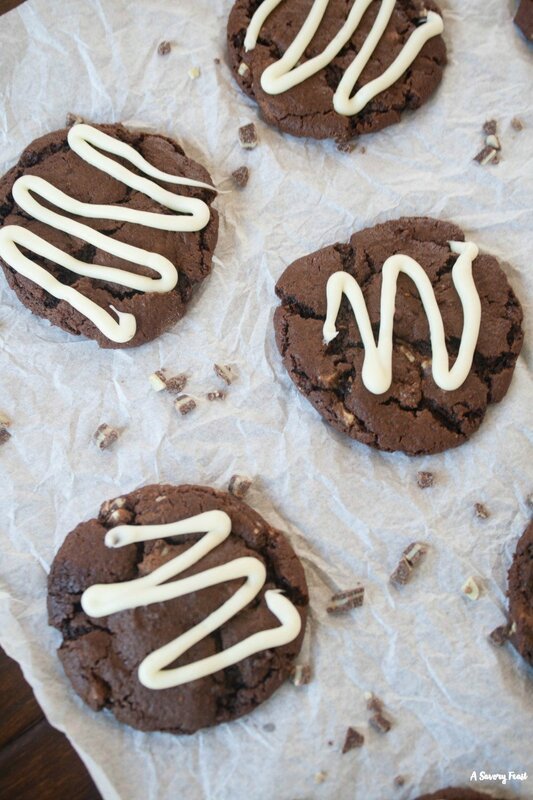 Drizzle the melted chocolate over the cookies. I used a piping bag to create a neat drizzle, but using a spoon to drizzle will work as well. Place the cookies in the freezer for a couple minutes to harden the chocolate. Store cookies in a covered container on the counter. I buy Andes Mints every year for stocking stuffers, but I’m definitely going to have to buy an extra bag this year to make these cookies! Yum! Steven would LOVE these! He loves chocolate and mint together. Peppermint and chocolate is my favorite this time of year, too! And I have a feeling these cookies will not last long in my house because chocolate + Andes Mints = heavenly! Thanks so much for participating in this year’s Sweetest Season Cookie Exchange! This has been so much fun and seeing so many gorgeous cookies has me excited for ALL THE BAKING this year! It’s a winning combo for the holidays! Enjoy. Yessss I see we were on a similar vibe for our Sweetest Season cookies — Andes mint baking chips are the BEST this time of year! Love that beautiful drizzle! Thee sound perfect for a cookie swap! Yum! I think they would be a hit at a cookie swap! Andes mints are one of my favorite things. I love how you dolled these up with a white chocolate drizzle. I think you will be a huge fan of these cookies!